Kasim Gaidam, the state's Resident Electoral Commissioner, told the News Agency of Nigeria (NAN) on Sunday in Yola. "The Commission had prepared for the Supplementary Governorship election in the state. 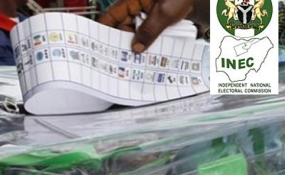 The election is going to be conducted in 14 LGAs, 29 Wards and 44 Polling Units spread across the state," Mr Gaidam said. He said: "Other figures being circulated should be disregarded as only report released by the Returning Officer should be considered."